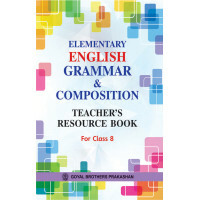 We are pleased to present the revised edition of ELEMENTARY ENGLISH GRAMMAR & COMPOSITION for Classes 6–8. Encouraged by the response and feedback, we have added new and innovative exercises to our Grammar Section and revised our Writing Skill section thoroughly. All the changes and additions have been made keeping in view, the suggestions of schools across the country. Foundation Mathematics Practice Book 1..